Grid It system keeps all cable/cord in place. Helps you organize all wires. Protect them from being caught and torn up. Ultimate Organizer for daily gadget! The organization system provides endless configurations for your digital devices and personal items. 12.5 inch， perfect for your existing bag/case for ipad, you will save time on the go by easily finding what you need. Most versatile organization system. 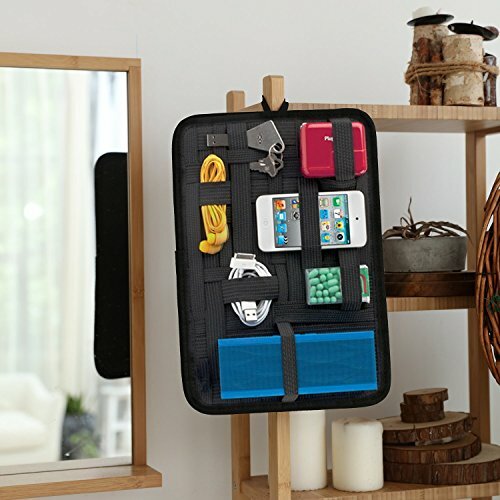 With a rubberized woven elastic object retention system for gadget organization you'll have endless configurations to hold items firmly in place. Intelligent, functional design is at the heart of each and every bag and case. This organizer's concept is to create a place where the technological extensions of our lives and work could be kept safe and organized; Wrapped up in their Cocoon, our digital devices are good to go. Please be kindly noted that this organizer is just a Board, NOT a Bag or Case. Please make sure you need a organizer board before purchasing. You can put it in your backpack,briefcase,messenge bag. Maximize space: Cord organizer Convent simple backpack/ bag/ briefcase/ carry-on into a multiple function bag in seconds. Checkpoint friendly: Everything you need is within sight, rather than hidden away at the bottom making the bag uncomfortable and lumpy. Size: 12.2 x 8.5 Inch . Balances out your bag by distributing items up rather than piled at the bottom of a bag.